What comes to mind when you think of a border? It may conjure the outer edge of a framed painting, or lines drawn on a map, or the port of entry en route to Montréal. In the current political climate, the concept of a border may also elicit rhetoric about walls, or fear of deportation. For dancers at Middlebury College, exploring that concept began with physical acts — touching a face, claiming space, blocking someone from passing, staring into another's eyes. 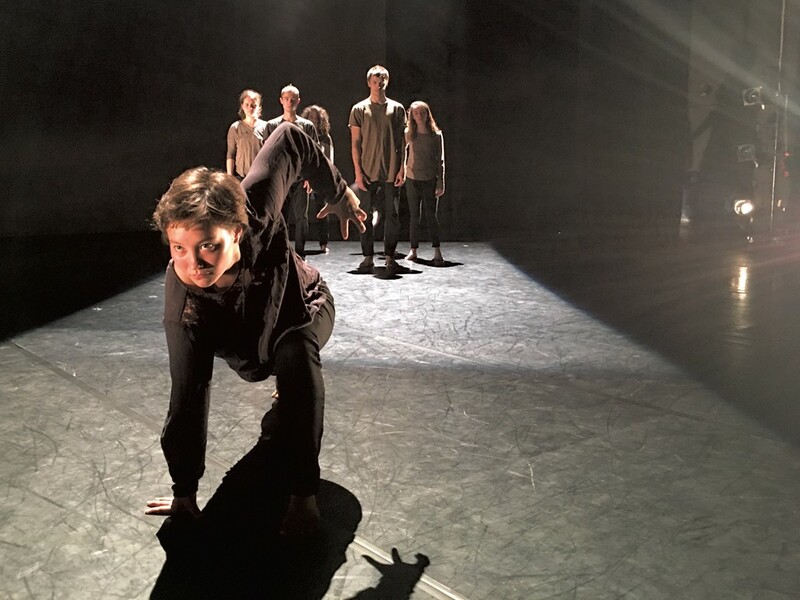 This weekend, the Dance Company of Middlebury will embody themes of boundaries and borders among nations, people and ideas in Border / Zones at the Mahaney Center for the Arts. The culmination of four months of work, the performance features two new pieces by American and Mexican choreographers created in collaboration with one another and with student dancers. Formed in 1980, DCM is a student company whose members, selected by audition, change annually. Each year, the company creates new work that is premiered in Vermont in conjunction with a national or international tour. Directorship of DCM rotates among Middlebury's full-time faculty. As its current director, Scotty Hardwig decided he "wanted to foster an international collaboration with artists in Central America." So he contacted his longtime friends and dance colleagues Claudia Lavista and Omar Carrum in Mazatlán, Mexico, about planning residencies at their respective schools. "I wanted students to get a sense that dance is global, dance is everywhere," said Hardwig. "There's a vibrant contemporary dance world in Mexico." Currently a visiting assistant professor of dance at Middlebury, Hardwig is a professional dancer, choreographer and digital-media artist who specializes in live performance that incorporates improvisation with digital technologies. Lavista and Carrum are dancers, co-artistic directors and choreographers of Delfos Danza Contemporanea. That professional company has created more than 60 works, which have been performed worldwide and received prestigious awards in Mexico, Brazil and the U.S. They are also codirectors and teachers at La Escuela Profesional de Danza de Mazatlán, considered one of the best modern dance schools in Mexico and Latin America. "This school really is an epicenter of contemporary dance in Mexico; the level of dance training and artistic rigor here is very high," said Hardwig. The residencies began last fall when Carrum came to Middlebury to work with Hardwig and DCM on creating the new dance pieces. "Omar and I gave students conceptual and physical frameworks to create movement material, so all of it has been generated by the students," Hardwig elaborated. "Then we directed, guided and shaped the choreographic structures from there." In early January, Hardwig and DCM traveled to Mazatlán for a two-week residency at EPDM that included daily dance classes, completion of the two pieces, rehearsals and the Mexican premiere of Border / Zones at the historic Teatro Ángela Peralta. Deborah Leedy, a junior at Middlebury and DCM member, said she has most valued "being immersed in the school in Mexico, seeing Omar's context and working with the students before performing with them." Hardwig added, "They're getting to experience the quality of the arts in Mexico, work with two world-class Mexican choreographers, establish connections with peers from all over Central America and train with them in a conservatory environment." Although planning for the project began in 2015, well before the presidential election, the piece's content couldn't be timelier. "The explosion of anti-immigration sentiment and xenophobia last year made our thematics even more present," said Hardwig. Everyone involved in the project wants it to generate discussion about boundaries between people related to race, nationality and identity. "It's symbolic that we're bringing a student from EPDM to Middlebury to perform with DCM," Hardwig said. "Artistic collaborations across boundaries and borders can be a model, or at least provide some amount of resistance against the rhetoric." In Border / Zones, that resistance takes physical form in athletic, high-energy dance that is harsh, dark and abrasive but also tender and poignant. Collisions between dancers, the interlacing of arms to create physical barriers, the locking of dancers' gazes — each moment explores concepts of borders and zones through kinesthetic experience. One of eight young men and women in DCM, Leedy said, "When two people look at each other, there's something going on there. Looking or not looking, everything makes or crosses some boundary." "Choreography is a physical metaphor," Hardwig added. "For me, modern dance is not representation of an abstract concept, but [rather] a physical experience of that concept. It is the thing itself." As dancers interact in real time and space, both they and the viewers are invited to grapple with their own thoughts, emotions and beliefs. The creative process itself inspired new insights as choreographers and dancers worked fluidly in English and Spanish, Hardwig said: "In the making of the work, we are bridging languages and cultures." Border / Zones features the new pieces created in Middlebury and Mazatlán — "sun breaks down" and a solo piece — as well as the DDC repertory piece "Dulce, Disonante, Entorno" by Carrum and Lavista. It includes digital set design by Hardwig and music by the Canadian group Godspeed You! Black Emperor and Belgian musician Thierry De Mey, as well as soundscapes of "noise, rhythms and spacious dissonance," Hardwig said. Audiences at this performance will enter a multimedia world, invited to reconceive that which separates and unites us through the universal portal of the human body. Elizabeth M. Seyler is assistant editor and proofreader for Seven Days. She also writes a bit, holds a PhD in dance, and teaches and performs Argentine tango.